UNION – It has been a trademark of the Ryle Raiders. They spread you out and put one or two running backs in the backfield and try to run the ball at different angles. Ryle came into the year with high expectations with the return of senior quarterback Nathan Davis. But Davis has been injured a good portion of the year and the Raider offense has struggled. Ryle had eight guys carry the ball against Highlands on Friday. But the Bluebird defense held its own in the 58-13 victory. Davis did not play against Highlands. The Raiders ran for just 210 yards on 63 carries for an average of 3.3 a touch. Tanner Paulice led the way with 59 yards on 26 carries averaging just more than 2.2 a touch. The rain kept a lot of people from the game Friday. The temperatures stayed in the 40s and 50s across Kentucky with heavy downpours. The rain came lightly during and after the game. But that did not hurt Highlands overall. The Bluebirds turned the ball over four times to once for the Raiders. But Highlands still outscored Ryle, 7-0 in points off turnovers. The game was stopped with 8:34 left in the final stanza because of an apparent neck injury to Ryle senior Dylan Plvan. The Highlands players asked for prayer on Twitter. The ambulance took Plvan to the hospital for precaution even though the announcer said he had movement. The Highlands faithful let out a cheer when it was announced that Conner defeated Covington Catholic, 13-12. That dropped the Colonels to 7-3 overall. But the Bluebirds could have a reason to cheer for the Colonels if the four host teams from Districts 7 and 8 advance past the first round of the 4A playoffs next week. That would put Ashland Blazer at Highlands and Covington Catholic at Johnson Central. If Both Johnson Central and Highlands win, Johnson Central would be the host of the regional title game. But if Covington Catholic and Highlands meet for the region title, it would come back to Fort Thomas like last year. Overall, District 7 finished 3-2 Friday. Harrison County lost, 38-10 to Woodford County. But Covington Holmes and Pendleton County picked up wins. The Bulldogs (6-4) dominated the in-town rival Holy Cross Indians, 50-0. The Indians (3-7) have struggled this year after winning the 2A state title last year. Harrison County finished 1-9. But the Thorobreds won the one game they had to against Pendleton County, 28-0 to make the playoffs. Highlands, Covington Catholic, Holmes and Harrison County automatically make the playoffs the next two years. Pendleton County has elected not to play in district action the next two seasons. The Wildcats (2-8) finished the season on a high note. Pendleton County knocked off Bracken County, 26-14 to conclude the season and snap a four-game losing streak. The Warren East Raiders and Russell County Lakers needed wins Friday to finish as the only undefeated teams in 4A. They earned the perfect 10-0 marks. The Lakers took out Adair County, 66-14 and the Raiders beat Bullitt Central, 35-6. It remains to be seen if Russell County can get past Boyle County (6-4) and Lexington Catholic (8-2) to the semifinals. The Rebels have won three in a row since the Sept. 28 loss at Lexington Catholic, 24-21. The Knights battled undefeated Bowling Green (10-0) hard Friday in a 35-21 loss. Both of LexCath’s losses have come to undefeated teams. The Knights fell 62-14 to Nashville Ensworth (10-0), the two-time defending Tennessee Division II-AA champions on Aug. 25. UNION – A little optimism abounded for the home team here – for a quarter. After a turnover-filled first quarter, the Highlands Bluebirds found their offensive groove. The quick-scoring offense put up 31 points in the second quarter and Highlands pulled away from the host Ryle Raiders, 58-13 at Borland Stadium on Friday. Class 4A’s top-ranked Bluebirds (9-1) quickly swished the bad taste of last week’s 38-24 loss to Cincinnati Elder, which snapped their 28-game winning streak, out of their mouths. The win also marked their first here since their only loss to a Kentucky team since the start of 2007, 28-26 in 2010. Highlands improved to 82-3 since the start of 2007. The Bluebirds are 77-1 against teams from Kentucky and 5-2 against teams from Ohio during that timeframe. Highlands outgained Ryle (3-6), 476-235 in total offense. That included 270-25 through the air. The Raiders had no answer for the Donovan McCoy to Luke Turner connection. Turner hauled in seven receptions for 172 yards and four touchdowns for an average of about 24.6 yards per catch. McCoy completed 15-of-21 passes for 257 yards, five touchdowns and two interceptions. The Highlands offensive line provided McCoy great protection all night. The Raiders did not record a sack of McCoy. The Bluebirds saw seven receivers make catches. Jaylen Hayes had three catches for 24 yards and rushed for 51 yards and a score. Teammate Jensen Feggins added two catches for 22 yards and Luke Brockett had Highlands’ other touchdown reception. Brockett also made all seven extra-point attempts and a field goal for 16 points on the evening. Highlands did not dress running back Zach Harris. But the Bluebirds more than made up for that. Josh Watson came in and led Highlands with 63 yards on four carries and a touchdown. McCoy and Ryan Donovan followed with 46 and 40 yards rushing respectively. The Bluebirds turned the ball four times in the first quarter including their first three offensive plays. The Raiders recovered an onside kick, another Highlands fumble and Ryan Rytlewski and Nick Kennedy recorded interceptions. But the Bluebirds defense held strong after the turnovers. Ryle did not even make a first down after any of the turnovers. The Raiders punted twice and did not convert on fourth down. Ryle’s lone touchdown of the quarter came when Highlands did not covert a 4th-and-1 at its own 46. The Raiders drove down to the Highlands 7 after Daniel Osborne ran for 33 yards on 3rd-and-7. On 3rd-and-goal from the 10, Eric Moore found Kyle Pangallo for the touchdown. It was one of just four passes the Raiders completed the entire game. They were 4-of-13 for 25 yards. But the Bluebirds erased that 7-0 lead quickly. Brockett hit a 23-yard field goal before Turner recorded touchdown receptions for 44, 12 and 33 yards. Brockett’s 15-yard touchdown reception with 9.6 seconds left in the half to put Highlands up 31-7. The Bluebirds extended the margin to 45-7 after the third quarter. Turner hauled in his fourth touchdown pass from 30 yards with 8:59 left and Hayes scored from five yards out. After Hayes’ score, Ryle ran a 16-play drive down to the Highlands seven before turning it over on downs. The Raiders scored their second touchdown with 9:10 remaining in the game. Cody Anzevino scored from nine yards out. Highlands scored twice in the final 14.2 seconds. Josh Watson scored on a 43-yard run and the Bluebirds scored their first defensive touchdown of the year on the last play of the game. Griffin Urlage picked off Ryle quarterback Eric Moore and returned it about 60 yards for the touchdown. The Bluebirds return to Fort Thomas to start the playoffs Friday in a first-round rematch with the Boyd County Lions (5-5). Highlands beat Boyd County, 63-7 last year. Head Coach Eddie Eviston and the rest of the Newport Central Catholic Thoroughbreds coaching staff made one thing clear to their football team after Tuesday’s practice. They were not going to let the Thoroughbreds become complacent after breezing through Class 2A, District 6. Fourth-ranked NewCath responded with its biggest win of the season scoring 34 straight points to beat the rival Beechwood Tigers, 34-14 at Newport Stadium on Friday. Both teams finished the regular season 6-4 overall. The Thoroughbreds ended the regular season with four straight wins. This marked NewCath’s first win over Class 1A’s fifth-ranked Beechwood since 2009 and first since Eviston took over as head coach in 2010. The Thoroughbreds have still won five of the last seven meetings and moved to 13-23 all-time against the Tigers. The two Northern Kentucky powers used to battle for district titles in the old four-class system prior to 2007. Beechwood has 11 state championships and NewCath has four. The difference in the game came in yards per play. NewCath averaged 7.9 yards a play on 48 plays and Beechwood averaged 3.6 yards a play on 69 plays. The Thoroughbreds gained 16 first downs, 215 yards rushing and 163 passing for a total of 378 yards to 18 first downs 174 yards rushing and 74 passing for a total of 248. Senior Dylan Hayes once again had a phenomenal game for the Thoroughbreds. He gained 170 yards on 23 carries and three touchdowns for an average of about 7.4 a touch. Hayes has rushed for 20 touchdowns this season. The Thoroughbreds mixed in some balance with the passing game. Quarterback Josh Cain completed 9-of-16 passes for 163 yards, including a 51-yarder to Mason Myers. Mac Franzen added three catches for 36 yards for NewCath. NewCath wanted to shut down Beechwood standout tailback Max Nussbaum. The Thoroughbreds held him to 67 yards rushing on 31 carries for 2.2 yards a touch. He quarterbacks the Tigers out of the Pistol formation and completed just 6-of-17 passes for 74 yards. Beechwood led 7-0 after the first quarter. Nussbaum scored from nine yards out. But the Thoroughbreds took the lead for good in the second quarter. Cain had a 1-yard touchdown run and Hayes scored on a 26-yarder to put NewCath up 14-7 at halftime. The Thoroughbreds extended the lead to 20-7 after the third period. Brady Thacker scored from eight yards out. Hayes added two more touchdowns in the final stanza to put the game away. They came from six and two yards out. The Tigers scored their final touchdown in the fourth quarter. Joe Studer scored on a 10-yard run. NewCath opens the playoffs this Friday at 7 p.m. against the Gallatin County Wildcats. Gallatin County is also 6-4, but has not played the tough schedule that NewCath has faced. It is a tale of two Northern Kentucky football powers with two similar seasons. Both the Newport Central Catholic Thoroughbreds (5-4) and Beechwood Tigers (6-3) struggled early against opponents from bigger schools. But they righted the ship against district competition sweeping through it and are now looking for momentum going into the postseason. The two teams own a combined 15 state championships. Beechwood’s last state title of 11 overall came in 2008 while NewCath’s last title came in 2010. The Tigers lost to western Kentucky power Mayfield in the last three state semifinals. The teams meet Friday at 7 p.m. at Newport to conclude the regular season for the sixth straight year. Beechwood has won the last two meetings. The Tigers knocked the Thoroughbreds from the ranks of unbeaten with a 29-20 win last year and won the 2010 meeting, 40-39 in double overtime on a controversial two-point conversion. The Thoroughbreds beat their Class 2A, District 6 opponents by a combined 219-32, including a 49-10 win over defending 2A champion Covington Holy Cross on Thursday at Scott High. The Tigers rolled through their three opponents in Class 1A, District 4 by a combined 164-40, including a 61-0 victory at Ludlow on Friday. The Tigers started the year at 1-3 with losses to Simon Kenton (21-17), Covington Holmes (33-21) and Covington Catholic (41-6) and a win over Covington Holy Cross (54-21). But they’ve won five straight since then. The Thoroughbreds also lost to Simon Kenton (28-20) and Holmes (12-7) in a 2-4 start. They’ve won three in a row. Team chemistry has been the key to NewCath turnaround. The teams have four common opponents. The two hold wins over Dixie Heights. NewCath beat the Colonels, 37-22 to open the season and Beechwood beat them, 33-28 on Sept. 28. The NewCath 4-4 defense will once again face Beechwood’s power running game. The Tigers run a lot out of the I-formation sets. Max Nussbaum has taken over as the feature back for the Tigers since returning from injury. Nussbaum has run for 1,009 yards on 94 carries and 14 touchdowns for an average of just more than 10.7 a touch. Teammate Mitch Thomas has 687 yards on 84 attempts and nine touchdowns for an average of about eight a touch. The Tigers are not afraid to throw the ball when necessary. Quarterback Cameron Lane has completed 28-of-54 passes for 357 yards and five touchdowns. Justin Suchanek leads Beechwood with 13 receptions for 197 yards and a touchdown. Teammate Chris Lightner has eight catches for 292 yards and five scores. The Thoroughbreds did a good job leveraging the Holy Cross skill position players outside toward the sideline or inside where teammates made tackles. They hope to do that again Friday. Ross Meek leads NewCath with 60 tackles and Mason Myers has 55. NewCath will counter with its balanced spread offense. The Thoroughbreds have rushed for 1,663 yards and passed for 1,334. Senior Dylan Hayes leads NewCath with 1,059 yards on 131 carries and 17 touchdowns for an average of just more than eight a touch. But the Thoroughbreds may pass more in this game. Beechwood runs base 4-3 and 3-4 defenses but could throw in some 5-2 to stop Hayes. Quarterback Josh Cain has thrown for 1,333 yards completing 102-of-172 passes with 11 touchdowns and five interceptions. His leading target is Mac Franzen with 34 catches for 634 yards and four touchdowns for an average of about 18.6 yards per touch. NewCath also wants to clean up on the personal foul penalties with another rivalry game. The Thoroughbreds had four against the Indians on Thursday while the Indians committed three. Beechwood leads the all-time series, 12-23. Prior to the last two meetings, the Thoroughbreds beat their former district rivals four straight times. The Highlands Bluebirds football team knows it can’t add on to its state record of 13 undefeated seasons. But the Bluebirds (8-1) did learn a valuable lesson from Friday’s loss to the Cincinnati Elder Panthers. They need to prepare better for teams like Elder that have big offensive lines and a bruising running back. Elder running back Chris Schroer ran for 259 yards on 45 carries for an average of 5.8 a carry and five touchdowns in the 38-24 Panther win that snapped Highlands’ 28-game winning streak. Other opponents have tried running between the tackles against the Bluebirds, but not with the same level of success. Boyle County did it well in the first half of the season opener. The Bluebirds are still 81-3 since the start of 2007. They bounced back in huge ways after the other two losses in that timeframe. After losing to Cincinnati Colerain in 2008, Highlands beat Covington Holmes, 70-6. Then in 2010 following that loss to Ryle, the Bluebirds smashed Woodford County, 70-8 to open the Class 5A playoffs. Photo by G. MICHAEL Graham/Fort Thomas Matters. Members of the Newport Central Catholic Lady Breds watch after falling to defending state champion Notre Dame, 3-1 in the 9th Region title game at Ryle on Saturday. The Lady Breds finished the year 14-6-1 with a 36th District championship. UNION – The Newport Central Catholic Lady Breds made the defending state soccer champions nervous hanging around for some time. But the deeper Notre Dame Pandas scored twice in the last two minutes to one time for the Lady Breds and held on for a 3-1 win in the 9th Region championship Saturday at Ryle. Notre Dame won the regular-season meeting by the same score on Sept. 18. The playoff matchups have been set for the Highlands Bluebirds and Newport Central Catholic Thoroughbreds football teams. Both will be top seeds in their respective classes and favored to win state championships. Highlands (8-1) is going for a Kentucky record six in a row and 22nd overall and NewCath (5-4) hopes for its second in three years and fifth overall. The Bluebirds won their 16th district championship in 17 years smashing the rest of Class 4A, District 7 by a combined 232-59 with one shutout. The only close game came Sept. 21 in a 35-21 win over the Covington Catholic Colonels. Newport Central Catholic was never seriously challenged in Class 2A, District 6. The Thoroughbreds outscored the other four opponents, 219-32 with two shutouts. NewCath has won eight straight district championships. During their impressive run of five state championships, the two losses for the Highlands Bluebirds football team came in even years. The Bluebirds hopes to buck the trend this year. With the way their seasons have gone, the only game of major concern after the wins over Boyle County, Scott County and Covington Catholic was the home contest against the Cincinnati Elder Panthers of the Greater Catholic League. That fear came to fruition in a 38-24 loss at David Cecil Memorial on Friday. The Panthers used their huge offensive line to open holes for junior running back Chris Schroer and the Highlands offense missed some opportunities in the defeat. The loss snapped a 28-game winning streak for the Bluebirds (8-1) and a 44-game home winning streak dating back to 2006. During their 81-3 run since the start of 2007, Highlands’ other two losses came at Cincinnati Colerain, 33-18 on Sept. 5, 2008 and 28-26 at Ryle on Oct. 28, 2010. The Newport Central Catholic Thoroughbreds soccer team played its best soccer toward the end of the season. Unfortunately for the Thoroughbreds, they ran into a team that had been playing well for a longer period of time in the 9th Region title game Friday at St. Henry. The Boone County Rebels scored twice in the second half to win the regional tournament 2-0. The goals came by Evan O’Hara and Brent Rice. The Rebels (18-3-3) had not lost in their previous 15 games sporting a 12-0-3 mark during that run. They knocked off 33rd district rival and 2011 state runner-up Ryle, 3-2 on penalty kicks in the district title game. The Newport Central Catholic Lady Breds found a spot in the 9th Region title game with a 1-0 victory over St. Henry on Thursday at Ryle. This marks NewCath’s first appearance in a regional title game since 2005. The Lady Breds lost 1-0 on a shootout to eventual state champion Highlands in the 10th Region title game that year. NewCath has won all three postseason contests by a 4-0 count to move to 14-5-1. The Lady Breds defeated Highlands, 2-0 in the 36th District title game before recording 1-0 victories over Covington Holy Cross and St. Henry. NewCath lost 1-0 to the Lady Crusaders (15-6-2) on Oct. 1 in a game called at halftime because of thunderstorms. St. Henry came into the season looking to win its second state title in three years thanks to the return of standout senior Libby Leedom. Leedom has committed to play at the next level for the University of Dayton. TAYLOR MILL – The emotions hit high points in the battle between the last two Class 2A state champions, both from District 6. But when the final horn sounded, the Newport Central Catholic Thoroughbreds showed why they’re once again the team to beat in the district and region if not the entire state of Kentucky. The Thoroughbreds (5-4 overall, 4-0 district) rolled to their third straight win and 23rd consecutive regular-season win against district opponents with a 49-10 bulldozing of the Covington Holy Cross Indians (3-6, 2-2) on Thursday at Scott High. They ended up outscoring the four district opponents, 219-32. This marks the eighth consecutive district title for NewCath and 20th overall. The Thoroughbreds improved to 17-2 all-time against Holy Cross. The only losses to the Indians came in 2006 and in the regional title game last year. NewCath made its faithful fans forget about that loss quickly. The Thoroughbreds dominated the trenches on both sides of the ball and on special teams. They built a 35-3 halftime lead and never took the pedal off the metal forcing the running clock in the second half. It is a game that has been on the minds of both sides for some time for different reasons. The Newport Central Catholic Thoroughbreds football team wants to expunge the sour taste of the 24-21 defeat to the District 6 rival Covington Holy Cross Indians on Nov. 18, 2011 in the Class 2A regional title game. The Thoroughbreds had ideas of repeating as state champions coming into last year. On the other side of the Licking River, the defending state champions want to become more than just a one-year wonder. Kyle Fuller booted a 32-yard field goal with about 10 seconds to lift the Indians to that victory. The Indians went on to beat Somerset in the state semifinals and Glasgow in the title game. Playoff seedings are at stake in this contest. The Thoroughbreds want to win another outright district championship. They stand 4-4 overall and 3-0 in district action. They’ve won 19 district titles overall, including seven in a row. NewCath has won 22 straight against district opponents in the regular season dating back to 2006, including a spotless 11-0 mark since Eddie Eviston took over as head coach in 2010. They’ve outscored district opponents, 170-22. The Thoroughbreds played a tough non-district schedule against bigger schools in Class 4A, 6A and Ohio Division III. Voters in the statewide Associated Press have taken notice of that. NewCath moved up three spots to fourth behind Owensboro Catholic, Somerset and Danville in the lastest poll. The Highlands Bluebirds football team has not been seriously challenged since the game against Covington Catholic. That could change this week as the 5-3 Cincinnati Elder Panthers come from across the Ohio River to face the Class 4A top-ranked and unbeaten Bluebirds (8-0). Highlands may be 4-12 all-time against teams from the current Greater Catholic League South. But that has changed in recent years. The Bluebirds are 2-0 during the 81-2 run since 2007 against GCL South teams and 5-1 against teams from Ohio. That includes a 34-29 win at Elder last year. Quarterback Donovan McCoy came on for the injured Patrick Towles and threw the game-winning touchdown pass to tight end David Christian in Cincinnati last year. That marked the first time in five tries Highlands beat Elder. Christian is hoping to play for the first time this year. He’s been out with a hamstring injury. Elder finished 2-8 last year playing without a number of suspended seniors. But the Panthers have a lot on the line coming into this game. ERLANGER – The Highlands Ladybirds volleyball team tried to take away the power hitting game of the Cooper Lady Jaguars. But that opened up the tipping game and Highlands (13-23) had no answers for it in the 9th Region quarterfinals Wednesday at St. Henry. Cooper (19-12) won 3-0 (25-16, 25-13, 25-20) to advance to today’s 9th semifinals against the hosts. Cooper recorded 41 kills, 29 assists, seven aces and blocked 10 to 25 kills, 17 assists, four aces and six blocks for Highlands. Julia Edmonds led the Lady Jaguars with 11 kills and Taylor Zingsheim had nine with Carley Powers adding eight. Hannah Reid led Cooper with four blocks with Powers and Edmonds making three each. Seven different Cooper players added and four had aces. Setter Tonya McDine led the way with 14 assists and Julia Klute recorded three aces. Highlands did not go away without a fight. Sophomores Jessica Ginter and Kaitlin Hall had great games. Ginter had 13 kills and five blocks and Hall recorded 16 assists. Senior Katie Van Curen recorded 14 digs in her last match. Junior Mallory Seidel followed with five kills. The Newport Central Catholic Thoroughbreds soccer team found itself up against the defending state runner-up in the 9th Region semifinals on Tuesday and many did not believe NewCath would win. The Thoroughbreds proved the doubters wrong in a 2-1 victory. NewCath has found its touch in the postseason winning four in a row to move to 7-9-5 overall. The Thoroughbreds battle the Boone County Rebels (17-3-3) on Friday at 7 p.m. for the 9th Region crown back at St. Henry. The Rebels have not lost since Sept. 7, 2-1 against North Hardin in the John Hardin Bulldog Challenge. This marked the second straight year the Thoroughbreds will play for a region crown. They beat Covington Catholic, 2-1 in the 10th Region title game last year before losing 1-0 to Montgomery County in the first round of the state tournament. UNION – Penalty kicks in soccer may seem easy. But they take as much work as anything in sports. The Highlands Ladybirds found themselves needing to make them to advance in the 9th Region quarterfinals against the Dixie Heights Lady Colonels on Monday. Highlands could not make enough of them in a 2-1 defeat. The teams made two each in the round of five before going to sudden death rounds. Both teams missed their first two shots. After Highlands missed again, senior Anna Crosthwaite scored to give the Lady Colonels (14-5-1) the win. Highlands finished 3-11-3 with the loss. That marks the lowest win total in school history. The Ladybirds finished 4-7-2 in their first season in 1987. In the initial round of five, Brooklynn Rivers and Kati Walls made their kicks for Highlands. But Anna Ochs and Chrissy Wolking equaled that for Dixie Heights. ERLANGER – The Newport Central Catholic Thoroughbreds and Highlands Bluebirds soccer teams found themselves on opposite ends of 1-0 scores in the 9th Region quarterfinals Sunday. NewCath defeated Villa Madonna by that score and Highlands fell to the host St. Henry Crusaders to finish its season. The games took place Sunday because St. Henry is also playing host to the 9th Region volleyball tournament. The Thoroughbreds have won three straight to improve to 6-9-5 overall and move to the 9th semifinals. Josh Hensley scored the game-winning goal 1:35 into overtime for NewCath. The two teams did not face each other in the regular season. The seventh-ranked Newport Central Catholic Thoroughbreds football team wanted to win consecutive games for the first time this year. They did that with a 49-0 thumping of the in-town rival Newport Wildcats on Friday in the Fireman’s Bell. The Thoroughbreds moved back to .500 at 4-4 overall and 3-0 in Class 2A, District 6 action. The Wildcats fell to 3-6 and 1-2. NewCath moved to 10-0 since Eviston took over as head coach in 2010 against district opponents during the regular season. The Thoroughbreds have also won 22 in a row against district competition during the regular season going back to 2006 and 14 in a row against Newport dating back to 1999. The game finished quick. NewCath scored 21 in the first quarter and added 28 more in the second to go up 49-0 at halftime and force the running clock. The running clock comes into play when teams lead by 45 points or more at halftime. The Thoroughbreds outgained the Wildcats, 319-198 in total offense, including 204-153 on the ground. Dylan Hayes again led NewCath on the ground with 12 carries for 125 yards and three touchdowns for an overage of just more than 10 yards a carry. Teammate Mason Myers had two carries for 39 yards and two touchdowns. NewCath quarterback Josh Cain completed 7-of-10 passes for 114 yards and a touchdown. Dan Ruwe led the Thoroughbreds with two catches for 68 yards. Defensively, NewCath focused on Wildcat running back Daylin Garland. Garland had just 43 yards on 16 carries and completed just 1-of-3 passes for a yard. COVINGTON – The Highland Bluebirds football team’s defense faced a spread offense for the second consecutive week. But it was a different spread look. The Covington Holmes Bulldogs came out in the Diamond spread look unlike the traditional one-back formation that Pendleton County employed last week. The Bulldogs lined up either quarterbacks Desean Peterson or Frederick Vickers in the shotgun and had two running backs beside them and one behind them in an offense similar to what the University of Nevada employs. Six different players ran the ball for Holmes, who came in without injured quarterback Rashawn Coston. COVINGTON – Fans and outsiders see things like overall program wins and consecutive state championships. But the Highlands Bluebirds football team players and coaches will be the first to say they look at accomplishing things on a day-to-day or year-to-year basis. This year’s Bluebirds can now say they have an undisputed Class 4A, District 7 championship after a 57-28 victory over the host Covington Holmes Bulldogs at Tom Ellis Field on Friday. The Bluebirds (8-0 overall, 4-0 district) have won six consecutive district championships and 16 in the previous 17 seasons. The only year they did not win a title was 2006 when Covington Catholic beat them on a last-second touchdown pass. Highlands senior Jesse Daley has verbally committed to play basketball at nearby Thomas More College next year. Daley stands at 5-foot-10-inches and is a two-year starter. She averaged 10 points and 5.61 rebounds for the Ladybirds last year. Daley also hit 66.3 percent from the free-throw line and 45.3 percent from the field as a junior last year. Daley becomes the second player from this year’s team to verbally commit to the next level. Teammate and fellow ‘Twin Tower’ Leah Schaefer verbally committed to Xavier University in the spring. The Ladybirds finished 17-16 last year. They lost to Newport Central Catholic in the 36th District championship before losing 13-8 to Notre Dame in the 9th Region quarterfinals. Jeff Hans is entering his second season coaching the Saints. They finished 25-5 last year and 17-1 in the Presidents’ Athletic Conference. The Saints also won their seventh straight PAC regular-season title, sixth consecutive PAC Championship Tournament title and made a sixth consecutive appearance in the NCAA Division III Tournament. They lost in the second round, 87-50 to 16th-ranked Illinois Wesleyan. Daley also plays goalkeeper for the Highlands Ladybirds soccer team and serves as a cheerleader at football games. Photo by G. Michael Graham. The Newport Central Catholic Thoroughbreds won their second straight district title with a 1-0 win over Highlands at Tower Park on Thursday. There are many reasons to throw out records once the postseason comes around. One is the return of key players from injuries. The Newport Central Catholic Thoroughbreds soccer team played competitive soccer all year, but had a hard time finding victories because of injuries, defensive mistakes and an inability to score goals. That changed Thursday in NewCath’s 1-0 District 36 victory over the Highlands Bluebirds at Tower Park. Both teams advance to the 9th Region Tournament. This marked the second consecutive district title for the Thoroughbreds. They beat Bishop Brossart for the 19th District title last year before beating Covington Catholic, 1-0 to win the 10th Region crown and losing 1-0 to Montgomery County in the first round of the state tournament. NewCath also beat Highlands for the first time since 2004. The Bluebirds went 11-0-2 in the last 13 meeting against the Thoroughbreds, including a 2-0 win on Sept. 22 at Tower Park. Photo by G. Michael Graham. The Newport Central Catholic Lady Breds soccer team won its first district title since 2005 with a 2-0 win over Highlands on Thursday at Tower Park. Both soccer teams knew they were headed to the 9th Region Tournament. It was just a matter of pride and momentum unlike previous years in the old 19th District with Bishop Brossart and Campbell County. The Newport Central Catholic Lady Breds came away with both in a 2-0 victory at Tower Park on Thursday. NewCath (12-5-1 overall) won its first district championship since 2005 and snapped a run of six consecutive district titles for the Ladybirds (3-10-3). Heavy thunder and lightning forced the cancellation of the regular season meeting for the two squads. The last time the Newport Central Catholic Thoroughbreds football team lost to its in-town rivals came during its last losing season. That was 1999 when the Thoroughbreds finished 4-8 including a 42-0 season-opening loss to the Newport Wildcats in the battle for the Fireman’s Bell. NewCath has won 13 in a row since that year including twice in 2007. The Thoroughbreds have also posted double-digits in the win column every year except a 7-6 campaign in 2009. During that run, the Thoroughbreds own three state championships, three state runner-up finishes and have been to the third round of the playoffs 12 consecutive seasons. In the two meetings since Eddie Eviston took over as head coach, NewCath has outscored Newport, 110-27. This includes a 56-14 verdict last year. Good football teams do not take plays off. 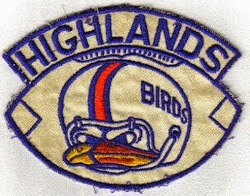 That has been a major trademark of the Highlands Bluebirds throughout the years. It has Highlands on the verge of another district title. There is one opponent left in the way of that. The Class 4A top-ranked, undefeated Bluebirds (7-0 overall, 3-0 District 7) hope to wrap up another outright district championship with a win over the improved Covington Holmes Bulldogs. Highlands has outscored district opponents, 174-31.